Drawings by a joint venture between McCarthy Building Companies and HITT Contracting show an aerial view of the new western headquarters of the National Geospatial-Intelligence Agency in north St. Louis. St. Louis residents are getting their first look at what the new headquarters of the National Geospatial-Intelligence Agency in north St. Louis will look like. 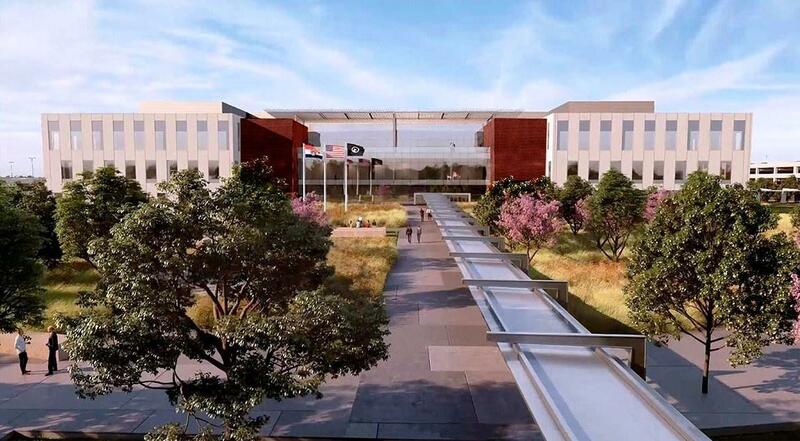 The Army Corps of Engineers, which is overseeing construction at the 97-acre site, released the drawings for the spy agency’s new campus on Tuesday. The office building, garages, visitors center and security checkpoints are being designed and built by a combined venture of McCarthy Building Companies, which is based in the St. Louis suburb of Rock Hill, and HITT Contracting, which is based in the Washington, D.C. area. “We will not get the contractor’s schedule for another six weeks, and we don’t have firm dates right now, but we anticipate the groundbreaking will be in the late summer or fall and hope that construction will start as early as late this year,” said Amy Snively, a spokeswoman with the Army Corps of Engineers, which is overseeing the NGA West project. The campus construction contract is worth $700 million, Snively said. “McCarthy-Hitt’s contract includes the design and construction of majority of the facilities, but it does not include all the facilities, nor the IT infrastructure necessary for the NGA missions,” she said. The construction of the campus should be done by 2023, Snively said, and the entire $1.75 billion project should be completed by 2025. It allows the spy agency to upgrade its facilities and allows for future expansion. Drawings by a joint venture between McCarthy Building Companies and HITT Contracting show the entrance to the National Geospatial-Intelligence Agency's new western headquarters in north St. Louis. Students from across the region will gather at St. Louis University Monday to explore careers in geospatial technology. The National Geospatial-Intelligence Agency and SLU are co-sponsoring the free one-day conference, which will bring together experts from industry, academia and government. Organizers hope the event will spur student interest in geospatial careers and establish St. Louis as a leader in the field. The National Geospatial-Intelligence Agency has released the location of six sites under consideration for its new facility in the St. Louis region. The city of St. Louis chalked up a big win, likely beating out St. Clair County for a federal spy agency. The National Geospatial-Intelligence Agency indicated in a report that the “preferred” site for its new facility is on the city’s north side. While the final decision isn’t expected until late spring, NGA director Robert Cardillo’s choice is expected to stick.